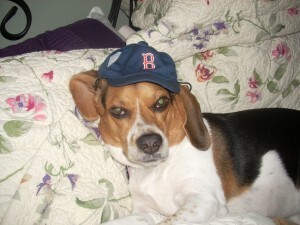 A blogger buddy, Chris Ray from Barkability.com has put out a challenge to Red Sox & Yankee fans. Whichever team finishes first at the end of the year – the owner’s dog will have to wear the other team’s colors and pose for pictures to be posted on the blog. Here at Baseballisms, we are former dog owners and are “in between” canines at the moment — so we’ve enlisted two friends from up in Boston, KC & Sadie, to act as our models for us. And yes, look closely, Sadie on the right actually smiles like that when she is being photographed! The Red Sox contingent is captained by the renowed Big Pupi, Chris’s dog MacKenzie will be filling out the lineups on the Yankees bench. KC & Sadie are hoping that J.D. Drew continues to set the world on fire, and the mixin’ and matchin’ that’s being done with all the visits to the disabled list keep working for the Red Sox so they won’t be caught wearing the Bronx pinstripes! 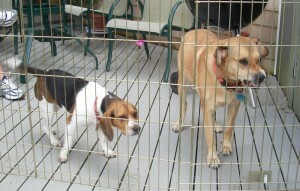 KC & Sadie – Thanks for participating! 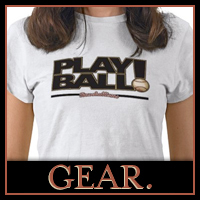 I'll be cheering on the Yankees from Minute Maid Park this weekend. Sadly, Mackenzie will need to watch from home. I'll have to send you a picture of Skip wearing his Braves bandanna that my mom made for him last Christmas. Dude … I'm just catching up on some stuff while on vacation. You have a dog named Skip!?! That's awesome .. You are a TRUE Braves fan…. If Skip isn't fixed has there been a Chip?